There is a great discussion going on at sensual jesus. Be sure to check it out. It is providing some great discussion and fodder for thought in terms of certaintude, belief and what, at the deepest level, we want from God. Certain to push out your boundaries. Does this fit your image of Adam and Eve? Does this fit your mental image of what Adam and Eve looked like? 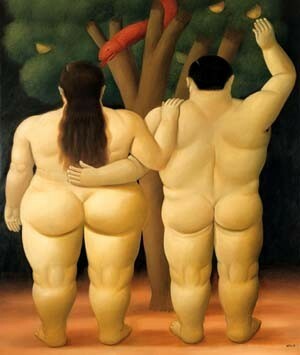 When I first saw this painting by Fernando Botero it messed with me. Of course that is not what Adam and Eve looked like! My mental image is one of a slender and beautiful Eve with dirty blond locks of hair flowing over her shoulders in perfect placement to cover over her bountiful bosoms. Standing beside her is Adam, self assured in his nakedness although conspicuously always pictured behind a waist high hedge (must of been lots of those hedge in Eden). This is what art does. Art exposes, reveals and refreshes. Every idea and thought we have is also associated with a mental image. Art, especially good art, exposes those mental images and gives our mind the option of something different. Art gets us to see something that we haven’t seen before. Or maybe we have seen it before, but with the anchor of repression we block and ignore certain images because of what they do to us. Some images frighten us, some pieces of art invoke feelings or emotions that we dare not acknowledge being there. I feel this is the reason why Mel Gibson’s movie the Passion was so successful. What this movie did was challenge our sanitized images and versions of the crucifixion and exposed our current images as the comfortable Easter/nice little bunny season holiday that it has morphed into. Now, although the violent monolithic picture of the cross was IMHO a little too focused on the blood and gore, it did cause me to think and to re-imagine some of my images. 2. Art exposes how static our thinking has become. Left to ourselves we will have the tendency to hold onto those images that secure and validate our past history and current culture themes. We cling to the images that agree with our history. When we encounter an image that transcends our past and sends us into a trajectory that causes us to consider our own past actions and thoughts as being incorrect or incomplete, we initially want to reject that image. In addition to our own personal history we also have to deal with our current culture matrix. What happens when we see an image that runs counter cultural to the mainstream culture that we are swimming in? We can either reject the image or we can accept the reality that our image has become frozen by time and culture. Of course this is normal. Remember that childhood friend that you grew up with and have now lost contact? When you imagine them, you don’t imagine them as they are now, but as they were when you interacted with them in grade 3. (This to me is the reason why Facebook as a social networking frame works so well, we all want up to date pictures and images to associate with our past memories) Deep down we all want new pictures and images. I believe this is part of the creative God image within us all. I also believe we have fallen out of rhythm with this creative tendency within us and instead now want to go back to the static photo album of who God has been in the past. We must move past the scrapbook snapshots of who God was and step into the nowness of a God who lives in real time. To deny that we have barriers is deny our own humanity. To be ‘full human’ is not to deny the existence of those barriers but to acknowledge that they exist and that they affect our lives. These mental obstacles and images have a direct correlation to our lives. A perfect example was when my wife and I went to go visit a living Nativity. There was a huge crowd. Lots of people, animals, Roman Guards, Villagers etc. In the midst of it, Toree lost track of our little girl Charlotte and had the typical fear response. Me in my, “nothing bad will happen” ideal, said to her(in the most loving and caring way of course), “Come on who is going to steal a little girl in the middle of a Nativity scene.” The scene of love, birth and nativity had in my mind made the place a safe place, which of course, by its very nature of strangers was not. To be fully human is not to deny the existence of those barriers but to acknowledge that they exist and affect our lives. Art, if we allow it, can be the light that shines and helps identity our presuppositions and assumption. One image that has become sterile and anti-septic to our souls is the picture of Christmas. Baby Jesus, wrapped in swaddling clothes, laying in a manager. Silent night, Hark the Herald Angels Singing, etc, etc. This season is filled with images. I would like to suggest an alternative image of this picture in my next post. Since I am a new owner of a Mac, I can join the chorus of PC haters. This video combines two of my favorite things the Matrix and Window bugs. I can truly attest that I do not miss the dreaded blue screen, the endless hourglass moments and constant freezing screens. Enjoy! And go buy a Mac. So it has been a little over a month since I have gotten rid of my AT&T data plan for my cell phone. Here is my update on what my life has been like since its departure. There are times that I have nothing to do and I am forced to do the absolutely frightening thing and sit in stilllessness with myself. No emails to check, no drudgereport to peruse. Only myself, plain ole me. I wonder if as a people we don’t really like ourselves. I mean, ever moment we are trying to get away from ourselves. We constantly are wanting distractions by means of music, movies, tv, email and books. Seriously, If I treated my wife like I treat myself, she would have divorced me years ago. Maybe the pertinent question is, have we divorced ourselves? Have I divorced myself? There is much encouragement to spend a “date night” with your spouse, to encourage conversation, engagement and time for relational growth together. But can I ask, when was the last time you took 30 minutes of silence and solitude and listened to the thoughts, feelings and emotions that are running through your head. So the disconnection I now feel in regards to my phone has been a reawakening of how much I fill my extra time with technological noise. There were times when I am waiting for my haircut where I am actually fidgeting with my phone like a crack addict, hoping for something to pop across the screen to entertain, to sooth the pain of the silence. When the silence becomes too overwhelming I crack and pull out a game of Solitaire, again filling my mind with some sort of noise. How much time do you spend alone with your thoughts, please take the informal poll below, I would find the results interesting? I encourage you, take a walk and unpack the clog of thoughts. Heck, even take yourself on a date… you deserve it.